Since 2000, there have been 17 K-9 teams trained and based out of the following cities; Detroit, Sterling, Virginia, Miami, Dallas, and Los Angeles. These K-9s are certified by the North American Police Work Dogs Association (NAPWDA). 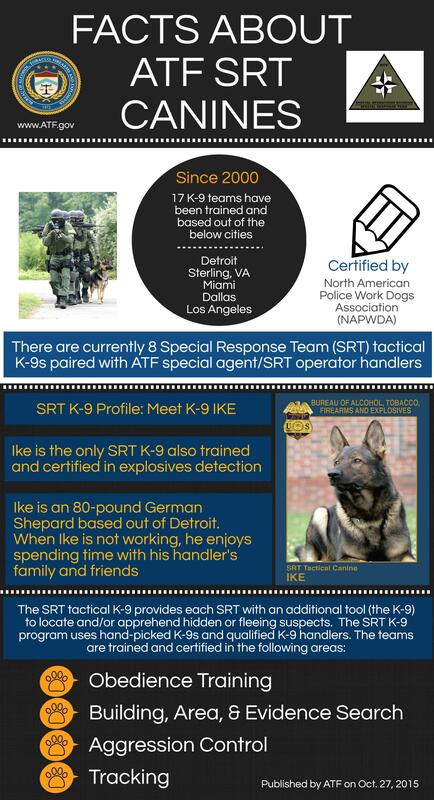 There are currently 8 Special Response Teram (SRT) tactical K-9s paired with ATF special agent/SRT operator handlers. Ike is the only SRT K-9 also traine4d and certified in explosive detection. Ike is an 80 pound German Shepard, based out of Detroit. When Ike is not working, he enjoys spending time with his handler's family and friends. Building, area and evidence search.